Since most of us in the United States stuffed ourselves with a Thanksgiving meal yesterday, we thought for our final Jingle Belles prompt of the year we would celebrate food. 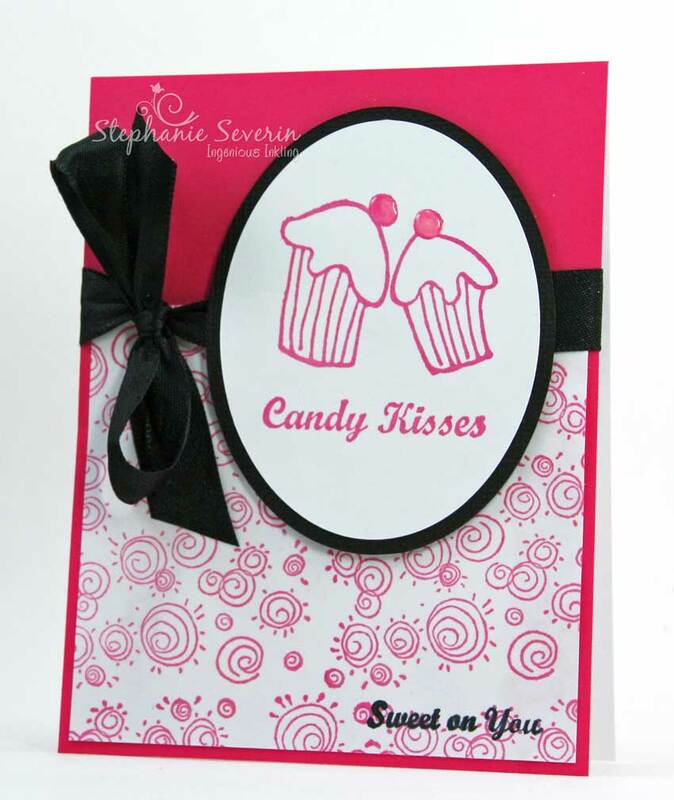 The theme for this week's prompt is Candy Kisses ... We're asking you to create a card featuring holiday food, drink or candy ... maybe for you it's gingerbread ... candy canes ... or cookies & hot cocoa ... whatever foods mean Christmas for you. and they will be providing one lucky winner with a $15 gift certificate to use at their store. RRD is celebrating its first anniversary with several stamp specials through the end of the year including fabulous bundled savings. The Rogue Redhead behind Rogue Redhead Designs is the talented Shar of Ill Tempered Ink. 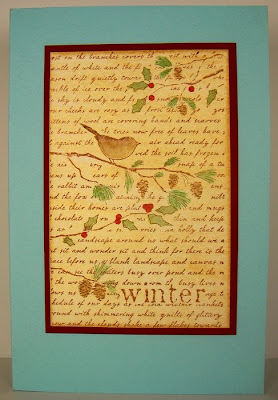 Shar says, "My addiction to paper crafting and stamping became passion, and I knew I would someday make my own stamps. Every so often people ask me about the name I chose for the company. The "redhead: part is obvious once you meet me. The "rogue" portion of the name comes from me not being great with rules. Even when I learn a new technique I tend to warp it ever so slightly in my execution. That works great for art (sometimes) but you probably don't want to test any of my baking :^)"
delicious holiday wreath ... love those red cherries on top. 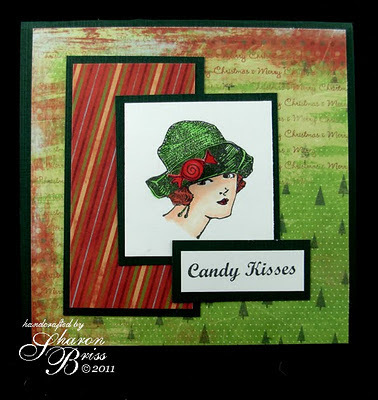 Here's what Lauren & I created with our fun Rogue Redhead Designs stamps. sweets as much as I do (bring on the dark chocolate salted caramels). The layout is this week's Sweet Sunday Sketch." So break out those calorie-free food, drink & candy images and create a yummy holiday card design. 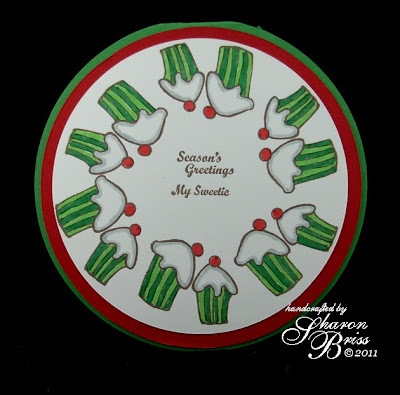 Upload your card by 6pm EST on Wednesday, November 30th using keyword JB48 in galleries including the Jingle Belles Flickr Gallery. We will choose one random winner for the $15 gift certificate to Rogue Redhead Designs. 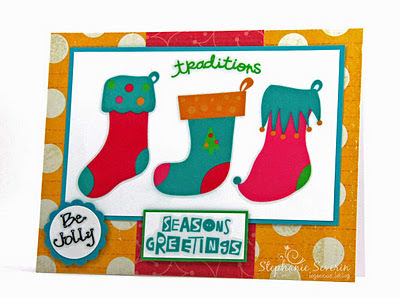 And as Lauren mentioned, Jingle Belles will be back in 2012 ... to once again take back December one holiday card at a time. 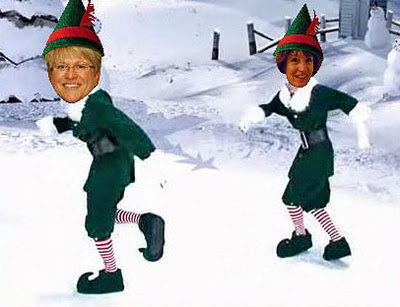 good morning, ♥JINGLE BELLES♥! we'd like to wish a very HAPPY THANKSGIVING to all of our friends in the USA; meanwhile, we hope that even if it's not a holiday where you are, that your thursday will be especially pleasant! 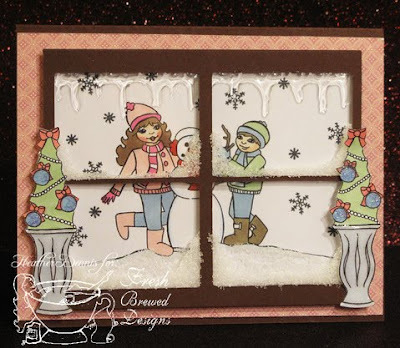 watercolored sky, artfully tore paper, and affixed tiny diamond stars, to give her lovely stamped figure a snowscape from which to enchant us! took C&S to a whole new level with a stark white background, a dramatically inky technique, and just enough glitter to make us say, "oooooooooh!" 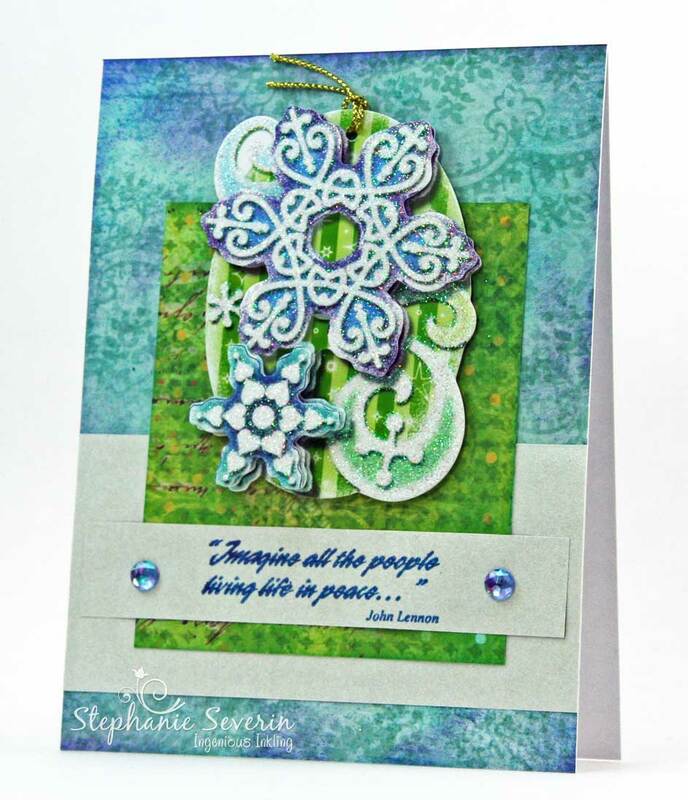 proved that one perfect stamp is all you need to make a gorgeous card... provided you also have an artist's eye and amazing color sense! 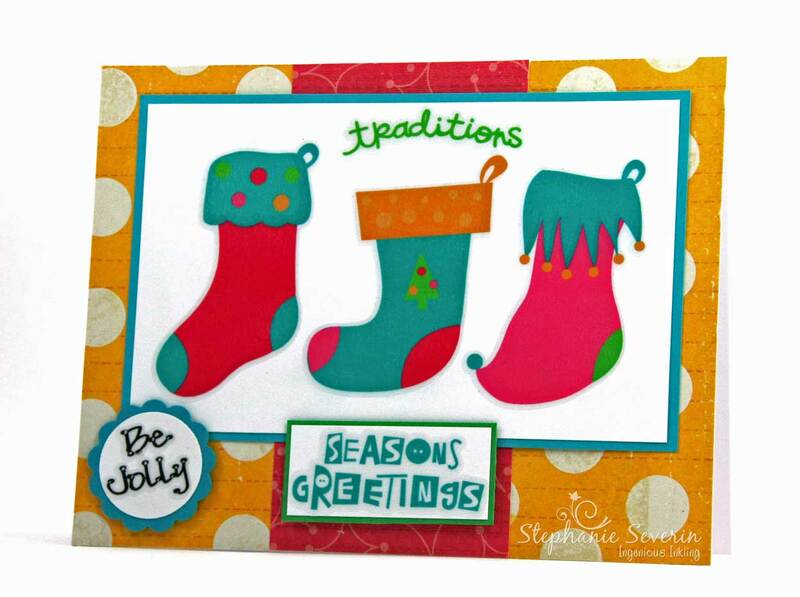 hello again, dear ♥JINGLE BELLES♥! can you believe that we're already onto the 47th of our 48 card-making weeks?! if you've been with us since the beginning, like stef and myself you're probably starting to look forward to a gloriously stress-free december! if you've only joined us recently, well done-- you're definitely ahead of the game! even if you've only just started to think about holiday cards: don't worry, it's not even thanksgiving yet! whether this is your 47th card or your first, just stop for a moment right now and take a bow! because handmade holidays are a BIG ACHIEVEMENT, whether you make every single card or just a select few for your deearest friends! there is absolutely *NO* wrong way to do this, we assure you!!! 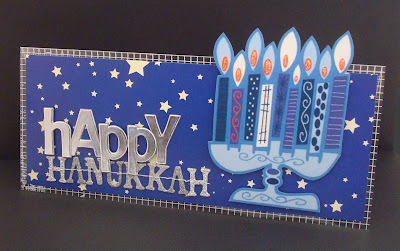 Lauren says, "i realize i tend to be known more for pink-n-sparkly, but i'm a pretty big fan of blue-n-sparkly cards, too... and hanukkah is sort of the ultimate occasion for that! 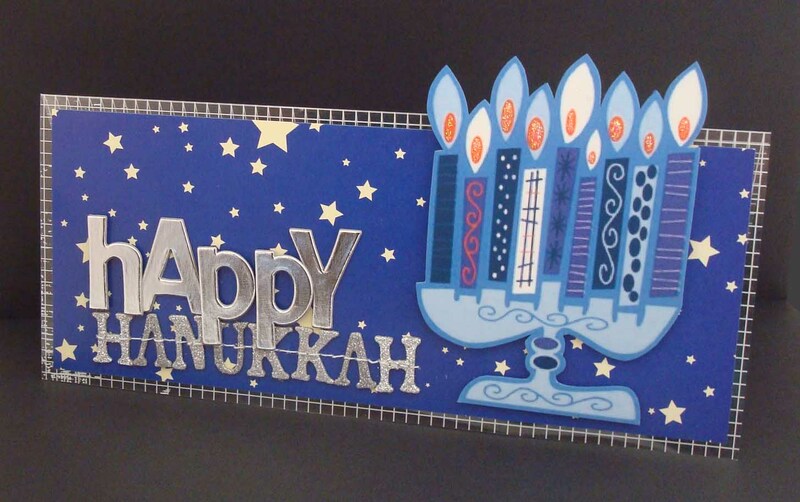 i've celebrated it here with a transparency-base "sideways tall card", some glossy blue starry paper, two different types of silver letters, and a fun, funky menorah that just wants to jump right off the page! bring on the festival of lights!!!" 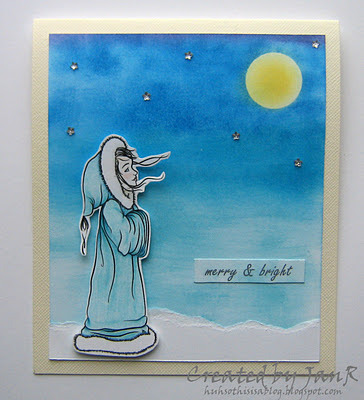 Stef says, "My go-to theme for the cards I design for my "non-Christmas-celebrating" friends is peace ... a theme I believe everyone can embrace. I usually pair one of my many peace sentiments with snow. For this card I used a favorite John Lennon quote with a pre-made dimensional glitter tag I found in the gift wrapping section at Michael's (cheaper than *official* card embellishments). The layout is the November Sketch for You to Try." and now it's time to see what you will do with this non-christmassy prompt! 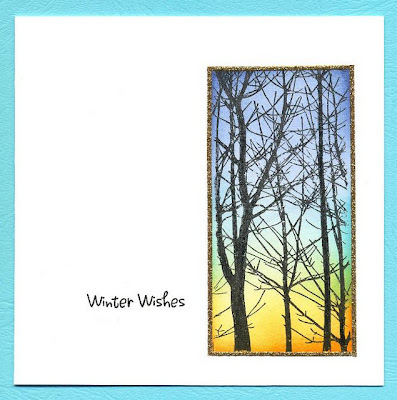 remember any other winter holiday is fair game: hanukkah, kwanzaa, the solstice, the new year; OR even a general wintery themed wish of "peace", a "thinking of you" card, or heck a pretty "thank you" note will do. put on your thinking caps and link up your best card creations by 6pm (EST) next wednesday, november 23rd! keyword for galleries and our jingle belles flickr group is JB47. We really enjoyed all of the sticker creativity this week ... we particularly loved some *vintage* stickers finally getting some love ... we don't even want to admit how old some of our sticker collection might be. A HUGE thank you to our fabulous guest stars Designer Team Members Liz & Amy from E.A.D. Designs and to the generous folks at E.A.D. Designs who sponsored this week's prompt. 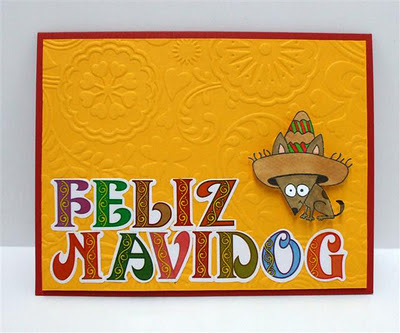 showed us that you don't need holiday stickers to make a fantastic holiday card ... she combined fun alphabet letters with holiday colors to her Chi-Chi's hat for this super-cute card. 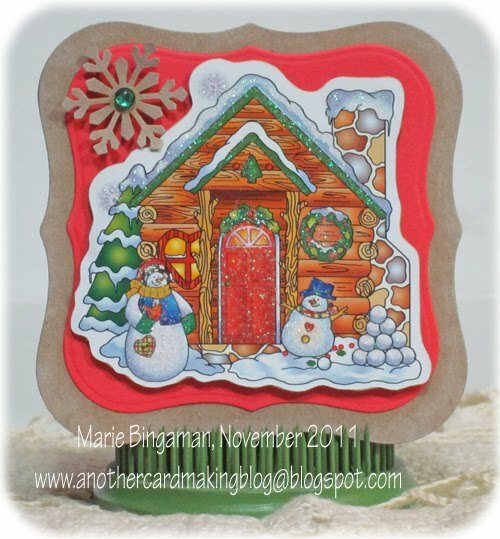 who knew Santa's belt could become a scalloped embellishment?? Marie of ANOTHER card-making blog? 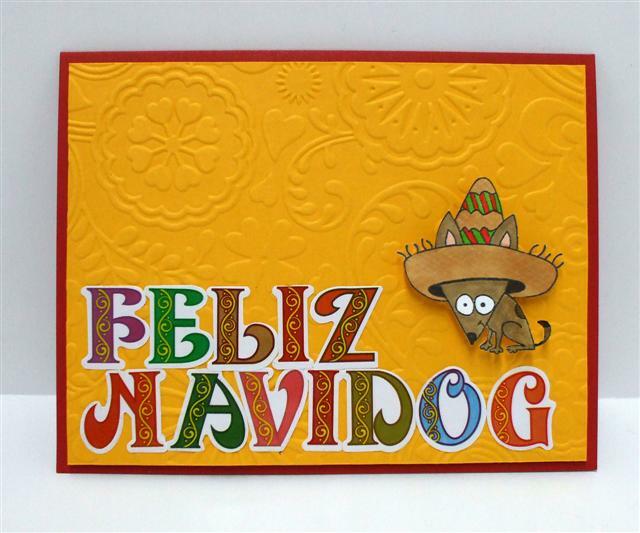 into this adorable little holiday card. to win our prize this week ... $25 Gift Certificate to E.A.D. Designs ... e-mail us and we'll get your gift sent on its day ... can't wait to see the fun things you create with all of those awesome stickerz. You know the drill ... make sure you stop by the fabulous cards in the gallery & leave a little jingle belles love (because seriously ... who couldn't use a few more kinds words in their life) ... and then check back at midnight for our 47th (can you believe it) holiday card prompt. 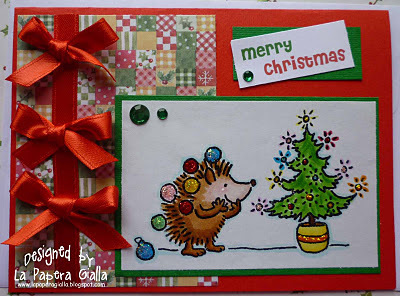 We're going sticker-crazy at jingle belles ... this week's prompt is to use at least one (or perhaps many more than one) sticker on your card. And to help us with this stick-y and sweet theme is one of our favorite sticker companies ... E.A.D. Designs. E.A.D DESIGNS is a family owned and operated business. Emily Nelson (owner) started E.A.D DESIGNS in 2002, and in a few short years has grown into one of the largest retailers/wholesalers for Vinyl Lettering and Wall Art. They started their scrapbooking rub-on line in 2009 and in 2010 started offering their amazing Stickerz. Not only did they provide Lauren & me with fabulous stickerz to design with this week (thank you very much), they are also providing one lucky participant in this week's prompt with a $25 Gift Certificate to their store (trust me, that will buy a whole slew of stickerz). And ... we're also thrilled to have several talented members of the Design Team at E.A.D. Designs join us this week. Liz of Liz's Paper Loft shares that she is married to a man that understands my need to be creative, and she has two grown daughters. She works part-time for a real estate company to support her *habit* ... a love for paper and all things crafty. 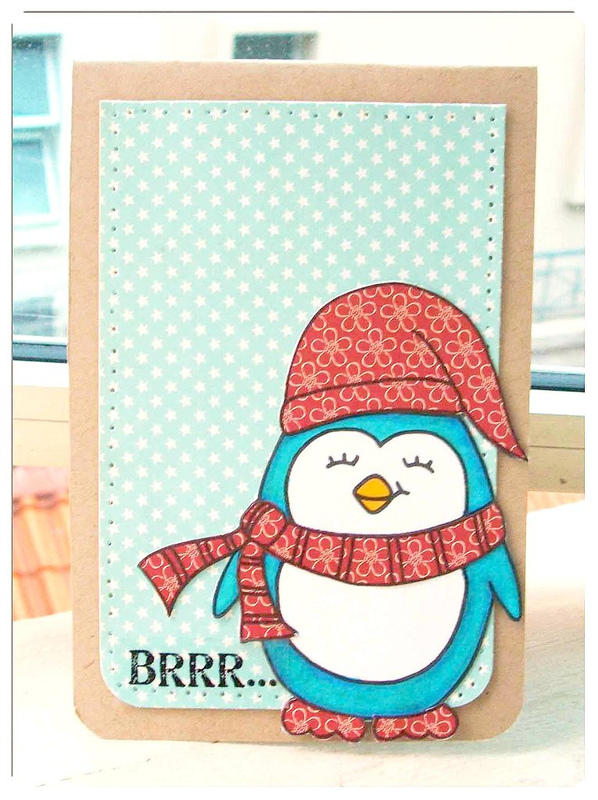 cute little Christmas Penguins stickerz." Amy Tsuruta of Tsuruta Designs shares that she lives in the beautiful state of Washington with her two fabulous kids & is engaged to the best guy ever! Her dream job would be to craft all day (wouldn't we all love that luxury). Amy also hosts the fabulous Flashback Friday Blog where we get to revisit our past creations (and be grateful for how far we've come). Woodland Friends Stickerz & Christmas Sentiments ~ for this fun holiday card design." 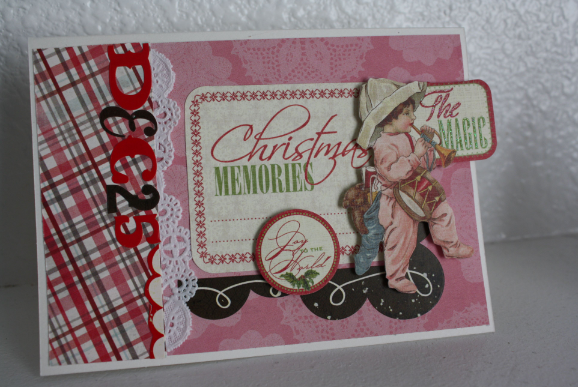 Stef says, "For my card, I combined clear stickerz from Jolly Stockings and Christmas Words with perfectly coordinated papers from Crate Paper's Snow Day Collection (while I prefer clear ... stickerz also come in white if you don't want the background color to show through). 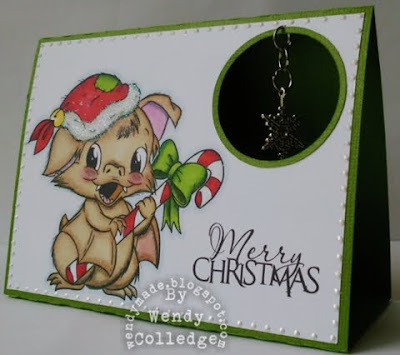 The sketch is from this week's Christmas Card Challenge ... so quick, easy & fun ... and did I mention ... stickerz are repositionable ... if you get things a little crooked, just lift it up & try again with no tearing." Lauren says, "for me, the only hard part of this assignment was choosing from the huge--and totally FABULOUS--selection at E.A.D. Designs! 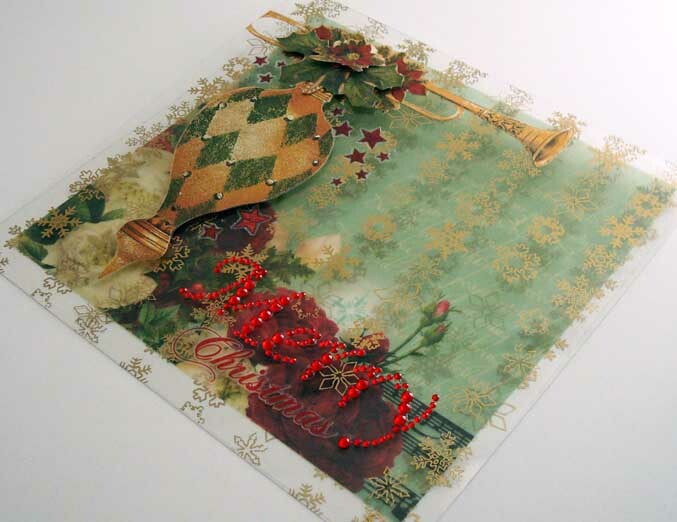 once i settled on deck the halls and retro christmas clear "stickerz" sheets, my work was pretty much done. all i had to do was choose a few coordinating patterned papers, layer my elements together and ♥VOILA♥ a card that's merry and bright in every sense! oh and did i mention i still have enough stickerz left for AT LEAST 3 or 4 more cards??! niiiiiiiiiiice!" We know you've got some stickers somewhere in your crafting stash ... pull them out and show us your holiday sticker creativity. And if you use E.A.D. DesignsStickerz for your card, remember to also link your card up at their monthly customer showcase for a chance to win even more goodies. Whatever you decide, link it up by 6pm (EST) next Wednesday night, November 16th. Keyword for galleries or the flickr group is JB46 ... we can't wait to see your sticker magic. it must be said, ♥JINGLE BELLES♥, that we secretly thought this week's prompt, with its emphasis on all things transparent, translucent, and see-through, was one of the technically toughest we've set all year. and yet... CLEARLY you had no trouble at all rising to the occasion with amazingly impressive holiday cards! created a fabulous landscape seen through an acetate window frosted with snow and ice! printed her sentiment on vellum edged with tiny, glimmery, totally glamorous glass beads! 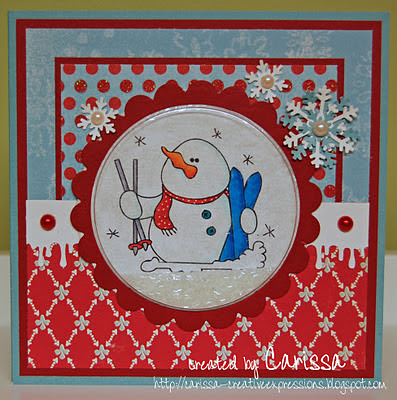 stamped and colored an adorable snowman... then built a real snowglobe around him! have you already guessed this week's theme, ♥JINGLE BELLES♥? has the emphasis of the word "CLEAR" given it away entirely? ok, then, you've got us: this week we're asking you to make a holiday card that contains at least one see-through element, whether that be glass, a transparency, some vellum, acetate or "ghost" shapes, clear stickers, lucite buttons, shrink plastic... whatever you like... if you can see through it (& figure out how to attach it!) put it on there and link it up! Lauren says, "i love making cards out of transparencies! probably because i love *LAYERS* so much, and the clear base gives you sooooo many possibilities on that score: you can use both the inside AND the outside in your design! plus the "wow factor" is kind of hard to beat, isn't it?! in addition to a gold snowflake transparency card base, i've placed holiday-themed vellum inside the card, and finished off with a few stickers, a couple of rub-ons, and a fancy bling word. i have to say i am pleased with this one, and can only tell you that if you like it A BIT in the photo... it's actually even cooler in real life!" Stef says, "Somehow I managed to temporarily *misplace* my box of transparencies during a recent studio reorganization, so as I was searching for them, I also looked for any other clear items I could incorporate into this week's prompt ... I finally settled on some acetate packaging that formerly held a bunch of tiny roses. I cut the *bubble* away from the packaging & punched a hole in the front of a folded piece of white cardstock, so I could fill my snow globe shaker with EAD Designs Stickerz and some clear bead-like shapes (the kind you find in the floral section to fill vases). Once I had that part finished, I created the front of my card (using this week's Cardabilities sketch) and then punched a hole through that, so I could slip in my shaker. 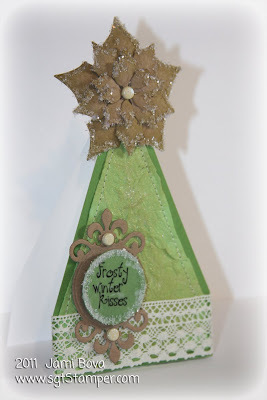 I finished with an EAD Designs rub-on sentiment, a felt snowflake & gem, and a base for my shaker snow globe. Papers are Echo Park Holly Jolly." We love how everyone embraced their favorite creatures this week ... we had dogs, bears, reindeer, birds, cats, hedgehogs, mice and even a few monstahs ... what fun! fabulous clean & simple design. love the holiday charm too. love those glittery holiday decorations. So take some time to skip through the Creature gallery and admire all of the fantastic holiday designs ... we'll be back at midnight with another fun holiday card prompt.